at a TMA Hard Hats for Little Heads event. I remember riding a bike as a kid. It provided a sense of freedom, giving me the ability to travel around the neighborhood and play with my friends. Experiencing the wind blowing in my face and the speed I could accomplish going down hills was sheer joy. As a kid, I never thought about safety. Fortunately, I did not have a major accident, only a few scrapes here and there when I fell. I remember a small cut on my forehead once, but I never needed stitches. As an adult, I became reacquainted with cycling during medical school. My roommate, Mike, convinced me to get a road bike for exercise. The joys of riding a bike returned, and I’ve learned to love riding in endurance events such as the MS 150 (a Houston-to-Austin bike ride that supports multiple sclerosis research) and the Hotter ‘n Hell Hundred (a four-day cycling event in Wichita Falls). You can see more while riding in the countryside at 15-20 mph on a bike than while driving at 70 mph in a car. It’s a great chance to experience nature more intimately. Left Image: Dr. Wright during the MS150 from Houston to Austin. Right Image: Dr. Wright (right) and friends Mike Lu (left) and Eddie Ngo (center) during the MS150. Now when I ride I always think about safety, and I always wear a helmet. Anything that can reduce the chance of head injury up to 85 percent is a great idea. Friends and patients have shown me their dented helmets after a fall but not more than a scrape on their body to show for it. 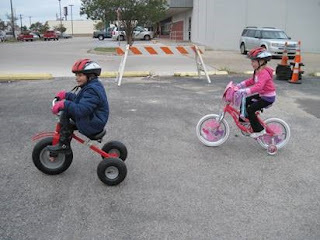 Their helmet likely saved them from a serious head injury. I first heard about the TMA Hard Hats for Little Heads program eight years ago. I have been hosting events yearly ever since and have given out hundreds of helmets to kids in our small, rural community of Port Lavaca. The local police department registers bikes at the same event. Dr. Wright fitting helmets on children at TMA Hard Hats for Little Heads events. I’m glad kids are still enjoying the outdoors and the simple pleasures of riding bikes. They have an advantage of having plenty of equipment available to make their excursions safer. Adults, be sure you’re setting a good example for the kids around you by wearing your helmet and encouraging kids to use properly fitted helmets, too. It just might save their life.